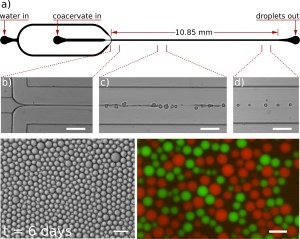 Complex coacervation involves aqueous two-phase separation that is typically driven by electrostatic and entropic interactions between charged polymers or macromolecules, and results in the formation of component-enriched micro-droplets suspended in a chemically deficient aqueous continuous phase. We have recently shown that this phenomenon can also be observed using mixtures of relatively low molecular weight components such as cationic oligopeptides (oligolysine) and monoribonucleotides (ATP). The spontaneous formation of micro-droplets in these equilibrium systems therefore provides a facile mechanism for membrane-free compartmentalization, and as noted by Oparin in the 1930s, could be highly relevant to prebiotic organization and the evolution of the first cells on the early Earth. 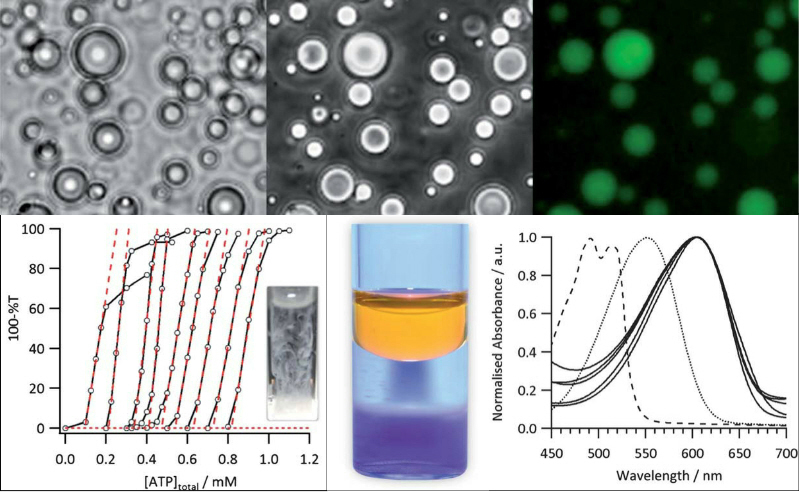 One of our recent interests focuses on investigating the formation of coacervate micro-droplets prepared by electrostatic complexation of cationic oligolysine and anionic nucleotides such as ATP. The droplets are highly enriched in peptides and nucleotides, stable across a large pH and temperature range, and capable of sequestering a wide range of low and high molecular weight solutes including enzymes, substrates, nanoparticles and photoactive molecules. The ease of preparation, molecular simplicity of the components, fundamental biological relevance of peptides and nucleotides, as well as the ability of the droplets to undergo growth and disassembly, suggests that a model of prebiotic organization based on coacervation should be seriously considered. We are developing various physical methods to elucidate the binding stoichiometries associated with nucleation and growth of the coacervate phase, and determine the polymer and mononucleotide concentrations within the droplets, as well as their dielectric constant, internal structure, surface charge, size, visco-elasticity and stability with respect to coalescence across a range of pH and ionic strength values. 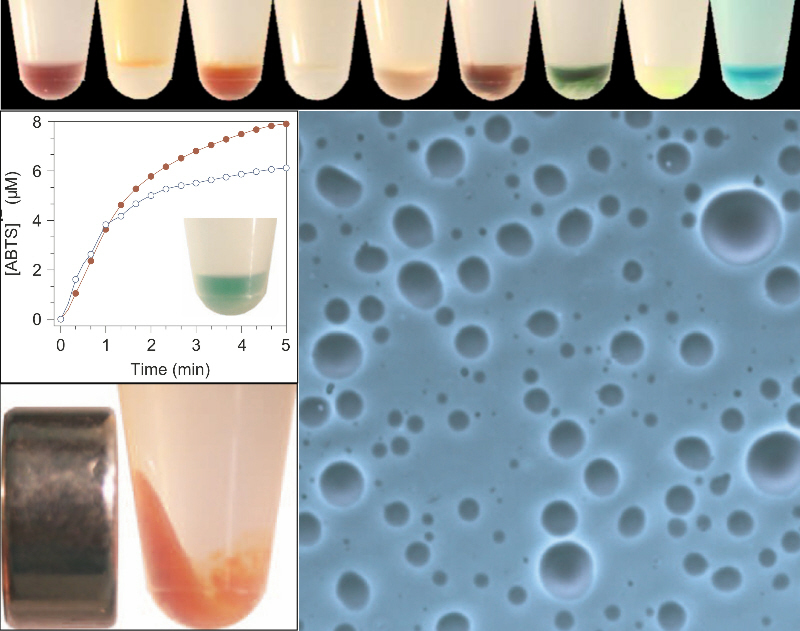 We are also investigating the partitioning of diverse solutes, including dyes, small and large biomolecules, and inorganic nanoparticles within the droplets, and have proposed mechanistic reasons for the observed differences in sequestration properties. In other work, we are studying the effect of the coacervate environment on enzyme cascade reactions, including the incorporation of a multi-enzyme system (minimal polyketide system) for natural product synthesis within the membrane-free micro-compartments. S. Koga, D.S. Williams, A.W. Perriman and S. Mann, Nature Chemistry, 2011, 3 720-724. M. Li, X. Huang, T.-Y. D. Tang and S. Mann, Curr. Opin. Chem. Biol., 2014, 22, 1-11. D S Williams, S Koga, C R C Hak, A Majrekar, A J Patil, A W Perriman and S Mann, Soft Matter, 2012, 8, 6004-6014. J. Crosby, T. Treadwell, M. Hammerton, K. Vasilakis, M.P. Crump, D.S. Williams, S. Mann, Chem Commun 2012, 48, 11832-1183. We are also developing new techniques to prepare coacervate-based protocells using flow-focusing channel-structured microfluidic devices. The droplets exhibit improved stability and narrower size distributions when compared to conventional vortex dispersion techniques. We are also interested in the use of two parallel flow-focusing channels for the simultaneous formation and co-location of two distinct populations of coacervate droplets containing different DNA oligonucleotides, so that we can investigate the exchange of genetic information between neighbouring protocells. van Swaay D, Tang T-Y D, Mann S, deMello A. Angew. Chem. Int. Ed. 54, 8398-401 (2015). A functionalized small-molecule dipeptide capable of structural adaptation is used to prepare coacervated-based protocells that exhibit a pH-triggered process of self-transformation and structural reconfiguration. Polymer-dipeptide coacervate micro-droplets are prepared at pH 8.5 from aqueous mixtures of poly(diallyldimethylammonium chloride) and deprotonated N-(fluorenyl-9-methoxycarbonyl)-D-Ala-D-Ala, and transform into discrete aster-like micro-architectures by controlled lowering of the pH to 4.5. 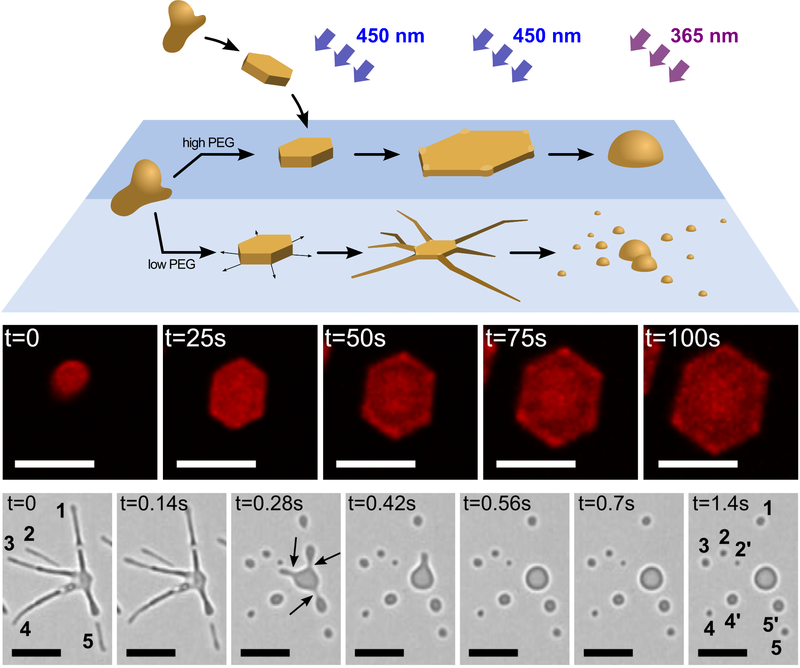 Reconfiguration of the micro-droplets results in entanglement and formation of an interpenetrating fibrous network that subsequently develops into a polymer-containing dipeptide hydrogel. Intrinsic diffrences in the molecular sequestration of folded and unfolded proteins within poly-(diallyldimethylammonium) (PDDA)/poly(acrylate) (PAA) coacervated microdroplets are exploited to establish membrane-free microcompartments that support protein refolding, facilitate the recovery of secondary structure and enzyme activity, and enable the selective uptake and exclusion of folded and unfolded biomolecules, respectively. The design of artificial chaperones has been inspired by naturally occurring molecular chaperones. 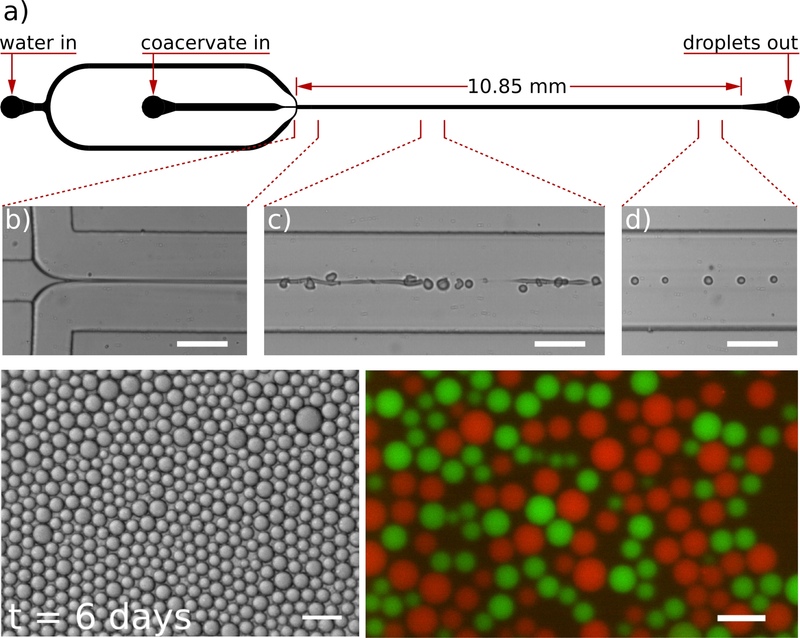 We developed and tested chaperone-like microdroplets as a step toward the construction of coacervate-based microdroplets capable of supporting the selective uptake and refolding of globular proteins. 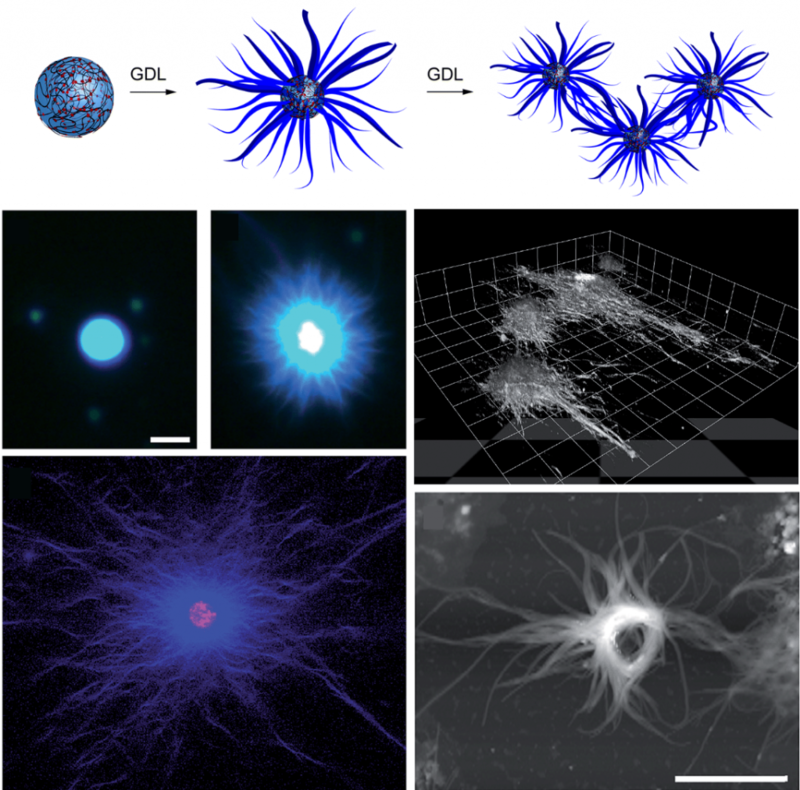 The observations provide new insights into the bottom-up design and construction of self-assembling microcompartments capable of performing biofunctions. Light-induced shape transformations represent a fundamental step towards the emergence of adaptive materials exhibiting photomechanical behaviours. We prepare discrete micrometre-sized hydrated particles of a hexagonally ordered polyelectrolytesurfactant mesophase based on the electrostatically induced co-assembly of poly(sodium acrylate) (PAA) and trans-azobenzene trimethylammonium bromide (trans-azoTAB), and demonstrate unusual non-equilibrium substrate-mediated shape transformations to complex multipodal microarchitectures under continuous blue light. The microparticles spontaneously sequester molecular dyes, functional enzymes and oligonucleotides, and undergo self-division when transformed to the cis state under UV irradiation. Our results illustrate that weak bonding interactions in polyelectrolyte-azobenzene surfactant mesophases can be exploited for photo-induced long-range molecular motion, and highlight how dynamic shape transformations and autonomous division can be activated by spatially confining azobenzene photomechanics in condensed microparticulate materials.